I’ve been back in New York City this week to participate in a terrific conference, the annual workshop of the Human Dignity and Humiliation Studies network, sponsored and hosted by Teachers College of Columbia University. Among other things, I gave a talk on the quest to advance and nurture dignity at work. I’ll be posting more about that on my professional blog, Minding the Workplace. During these all-too-brief trips to the city, I try to revisit favorite old haunts from my 12 years there. 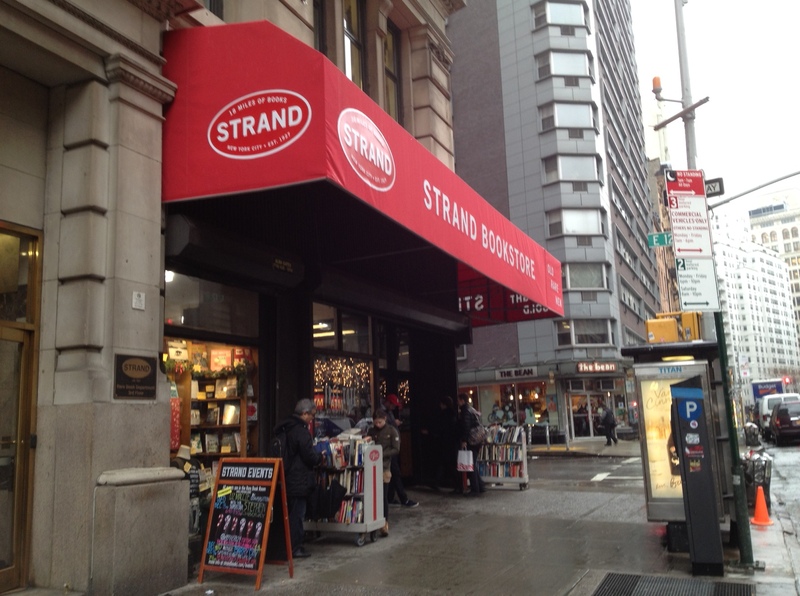 One of my stops was the famous Strand bookstore. Since my very first visit to New York in the summer of 1982, I’ve been there hundreds of times! When I lived in New York, one of my favorite ways to spend a free afternoon or evening was to go pick up a few discounted treasures at the Strand and then enjoy a hearty meal at the Cozy Soup ‘n’ Burger on Broadway & Astor Place. One of my law school pals (hey Joel!) introduced me to the Cozy some 30 years ago, and I’ve been making pilgrimages there since then. My usual order is a turkey burger (no fries) and a cup of their signature split pea soup. If it’s dinnertime, I also may splurge on an order of rice pudding. 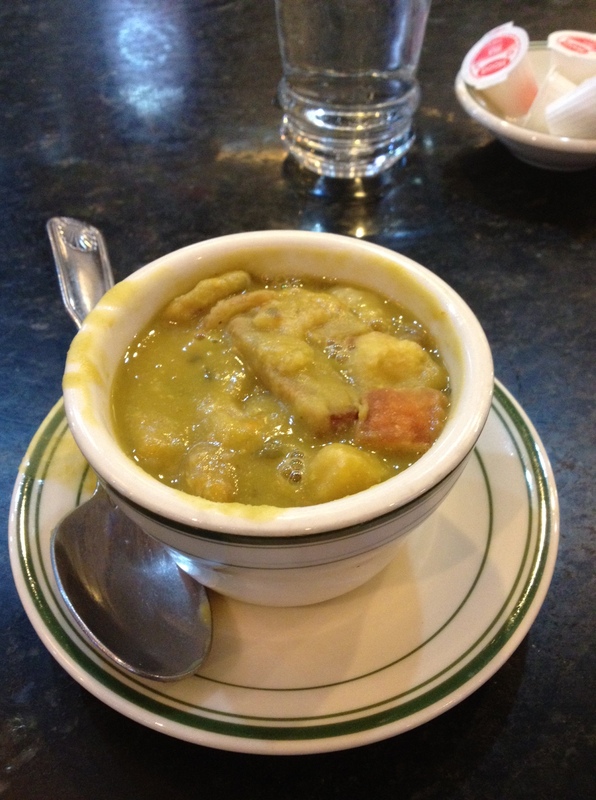 The Cozy’s split pea soup with croutons…as good as soup can get. 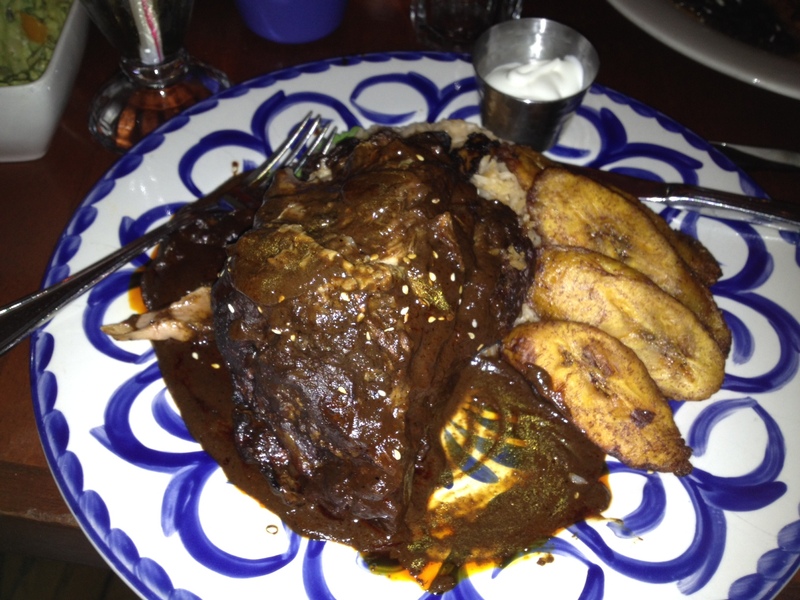 Wednesday’s dinner was at La Palapa, a real deal Mexican restaurant on St. Mark’s Place in the East Village. My cousin Judy, a superb restauranteur, is a manager. Fortunately I can champion the food because it’s sooo good, not just because I have a dear family member who works there! Dining with cousins Al, Aaron, and one of their friends, I had this incredible, fall-off-the-bone pork shank dish with rice and plantains. 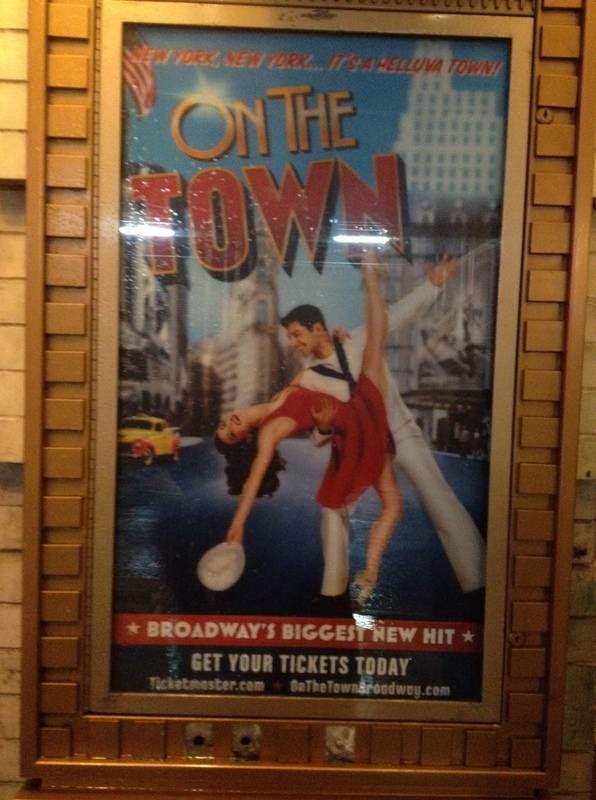 Cousin Judy and I also went to see a Broadway show, a top-notch performance of “On The Town,” the fresh, funny, and sharp revival of a 1944 musical about three U.S. Navy sailors enjoying a 24-hour leave in New York City. 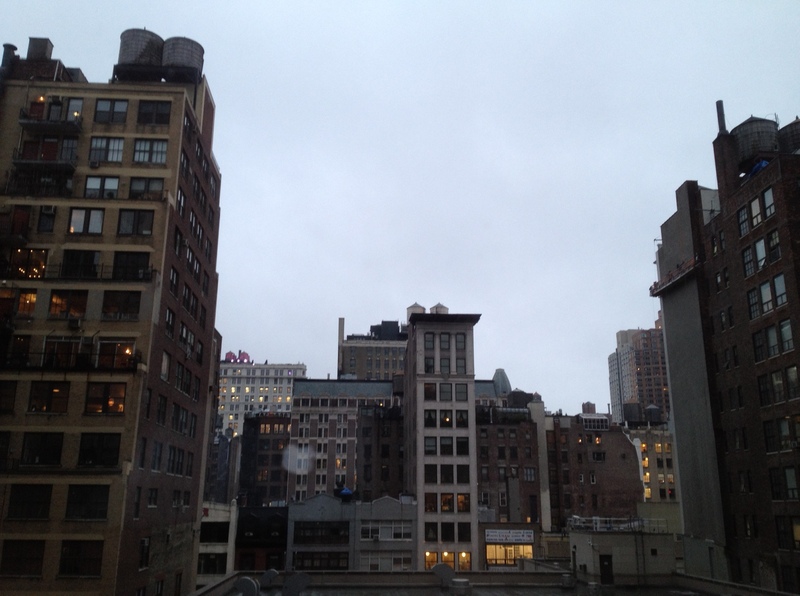 This visit also overlapped with serious real-life events in New York. On Wednesday, a Staten Island grand jury opted not to indict a white police officer, Daniel Pantaleo, who had placed an unarmed and secured African American man, Eric Garner, in a fatal chokehold. Especially because the July incident was captured on videotape, the decision has sparked major protests in the city (and elsewhere). 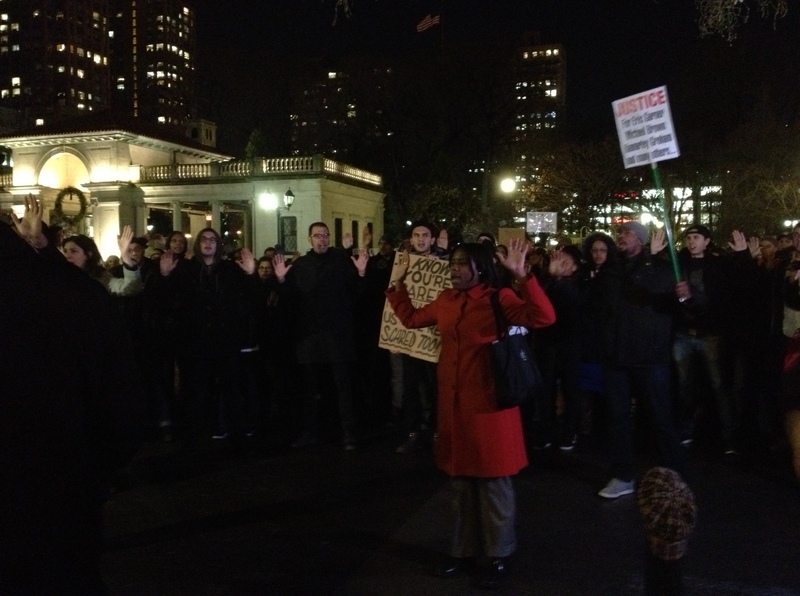 Here was the scene Wednesday night in Union Square at 14th Street in Manhattan.